The benefits of hiking are undeniable. Not only do you get to enjoy fresh air and the sights and sounds of nature, you can get a great workout. 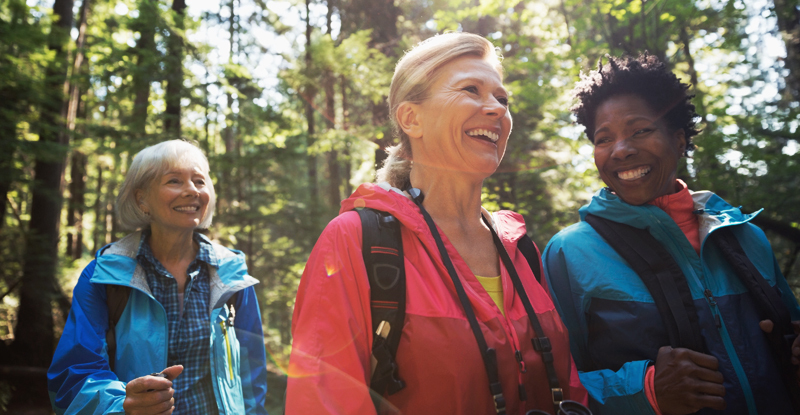 Depending on the type of hiking you are doing, you can strengthen your core, improve your balance, build strength in your hips and lower legs, and boost your bone density. But there are a few safety considerations you should keep in mind before running to the trails this summer. These tips can help you stay safe and have a great time. Pack proper gear: What you pack will depend on the trails you plan to take and the length of your hike. You should carry water, a snack, any maintenance medications, and a small first aid kit on every hike. Take it slow: If you are new to hiking, start out on short, local trails. As you gain experience, you can head out on longer hikes on uneven terrain and hills. Research the route: Review the trail map before your journey. This may help you stay on the marked trails. If possible, pack a map for guidance and easy navigation. Check the weather: The weather can change fast, so make sure you check the forecast before you hit the trail. Consider making alternate plans if the weather is supposed to get bad. Buddy up: If you’re new to hiking, you should avoid going out alone—especially on unfamiliar or remote trails. Having a partner can come in handy if you experience an emergency or get lost. Inform friends or family: It’s important to let your friends or family know where you’re going and when you expect to return. Provide an itinerary if you can. In an emergency, they can use the itinerary to find you. Stay on the trail: There can be serious consequences to wandering off marked trails, including getting lost or injured. And staying on the trail is the best way for you to preserve the delicate environment that you came to see! Do not feed animals: Most wild animals have diets that do not include processed human foods. Consuming it may make them ill. And it can be dangerous to feed large animals like bears. They may attack other people to get more human food. Follow trail etiquette: Remember, you are not the only person using the trail. These routes are used by runners, hikers, and horseback riders. Be respectful and courteous by yielding to others when necessary or appropriate. Prevent ticks and other bugs: Encountering creepy crawlers is a standard part of spending time in a forest. To avoid being bitten or stung, don’t walk through brushy areas or tall grasses, and don’t go too close to low-hanging branches. You should also use DEET-based insect repellent on all of your exposed skin. Stop: If you are lost, stop immediately and call for help using a whistle or your cell phone. Think: Remain calm and refer to the plan your group put in place. Calmly consider all your options before you take any action. Observe: Look at your surroundings and identify what you have that may be useful. Consider whether it’s safe to stay where you are. Plan: If you left a plan with friends or family members, follow through with it (if possible). Find a safe place to wait to be found. Stay together: If you’re hiking with a large group, stay together! Put a leader in place in the front of the group and another at the rear. This will help prevent slower or faster hikers from straying. Pack bear spray: If you plan to hike in a remote location where bears have been spotted, you may want to take bear spray. You might not need it, but it would be better to pack it than to wish you had. Check for ticks: Before you get into your vehicle, check yourself and your hiking partner for ticks or other bugs that might have latched onto you during the hike. Hydrate and refuel: After a hike (especially on a hot day), it’s essential to rehydrate and refuel (get the nutrition you need). Rest and recover: Depending on the length and difficulty of your hike, you may want to relax or massage any sore or uncomfortable areas. In addition, you should monitor how you’re feeling, especially if you have any health concerns or conditions. Safety is the most important prerequisite for a good time in the great outdoors. With a little planning, you can enjoy peace of mind from knowing you’re prepared for any challenges.